As one of the nation's top scientists in the space program, Dr. Nancy Roman was an advocate of women in the sciences. 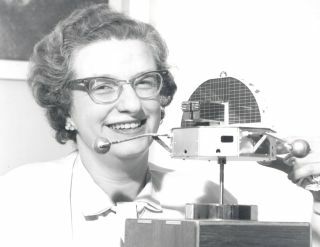 In this historical photo from the U.S. space agency, Dr. Nancy Roman, one of the nations top scientists in the space program, is shown in 1963 with a model of the Orbiting Solar Observatory (OSO). Roman received her Ph.D. in astronomy from the University of Chicago in 1949. In 1959, she joined NASA and in 1960 served as Chief of the Astronomy and Relativity Programs in the Office of Space Science. Roman was very influential in creating satellites such as the Cosmic Background Explorer (COBE) and the Hubble Space Telescope (HST). She retired from NASA in 1979, but continued working as a contractor at the Goddard Space Flight Center.